The research portfolio at the Fred W. Smith National Library is accompanied by an innovative AV system spanning 45,000-square feet and three stories. The entire audio infrastructure is transported by a Dante networking architecture via Symetrix Edge routing gear. 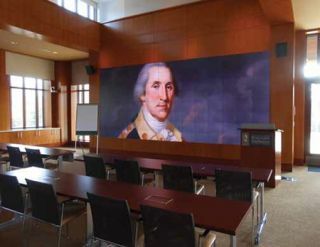 MOUNT VERNON, VA—The Fred W. Smith National Library bills itself as a center for cutting-edge and compelling scholarship about George Washington, Colonial America and the Revolutionary Era. Located on the property of the first president’s home in Mount Vernon, VA, the privately-funded library is a 45,000-square foot, three-story building that houses thousands of books, newspapers, maps, photographs, microfilms, periodicals, and electronic resources pertaining to the life of George Washington, as well as more than 100 books from his personal library. The cutting-edge research portfolio is accompanied by an innovative audiovisual system that enhances the overall educational environment. In addition to a small production studio and video displays in the main reception hall, the large leadership hall room acts as a lively space for lectures from visiting authors and scholars. The entire audio infrastructure, covering these spaces plus additional outlying rooms, is based on a Dante networking architecture from Audinate, featuring Symetrix Edge routing gear. IES Communications of Roanoke, VA, was engaged to integrate the audio-visual systems. A simpler approach to cabling and connectivity proved to be equally important on the audio side. The previous specification was based on a complex architecture that required a labor-intensive integration process. Additionally, there was little freedom to alter or expand the audio architecture based on the existing specification. Furthermore, lengthy distances between leadership hall, the production studio, and three smaller conference rooms made connectivity between these five critical media-centric spaces impossible in the previous specification. That lack of flexibility would prove especially problematic for larger lectures, where overflow audiences watch lecturers and listen to live audio feeds across the various conference rooms. To accommodate more flexibility, Hogan and his team recommended switching to an Audinate Dante network, with Dante-enabled Symetrix SymNet EDGE gear to handle multichannel digital signal processing network-wide. On the video side, one key upgrade was switching from a DVIonly video transport solution to a more comprehensive Crestron Digital Media solution. The Crestron solution had the dual-benefit of incorporating higher quality HDMI transport while supporting a hybrid architecture of both analog and digital technologies. The transition to HDMI also simplified cabling on the video transport side, switching to a single-cable structure as opposed to the dual-cable configurations required for the DVI transport architecture.